Quictent® is one of the top brands who sell high quality structures like Greenhouse, grow tent, marquees, gazebos, camping tents etc. Quictent has been doing tents business since early 21st century. After more than a decade of development, it has become one professional tent manufacturers with its own core production technology, more large market share and excellent after-sales support. High Quality, Heavy-Duty Powder Coated Steel Framework. Longer Life to Use, Make the Whole Product More Firmly, Especially in Bad Weather. 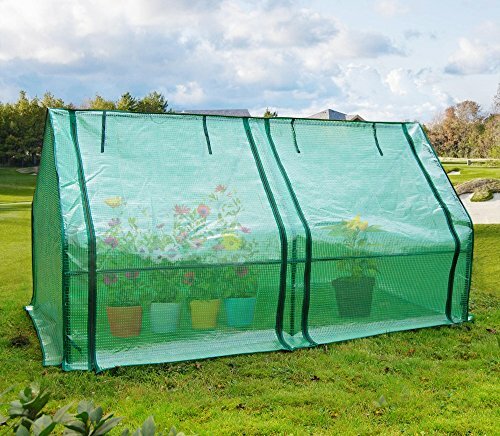 Transparent PE Cover with Zips for Easy Access and Ventilation, with Ropes Let Cover and Frame Combined Better. UV Protected and Transparent, Waterproof, Green PE Reinforced Cover Offer Maximum Sunlight. Updated Design, 2 Doors Can be Completely Opened and Rolled Up with Rope, Give You a Bigger Operating Space and Better Ventilation. Extended Cover Design, Makes Greenhouse More Airtight and Secure, Just Bury It in The Soil. Easy to Set Up, Portable and Sturdy, Can Be Used Both Indoors and Outdoors. ISO 9001:2000 Standard Certified Manufacturer. High Standard and Reliable.